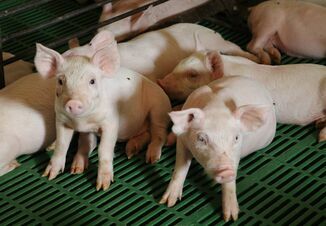 Daniel Ciobanu, associate professor of animal science at the University of Nebraska–Lincoln, led an eight-year research project to identify the gene associated with pigs’ susceptibility to porcine circovirus 2. He is pictured with team member Lianna Walker, graduate student at Nebraska. Severe weight loss, respiratory and digestive conditions, and immunodeficiency that can lead to mortality are just a few reasons why porcine circovirus 2 (PCV2) is one of the most detrimental diseases in the swine industry today. 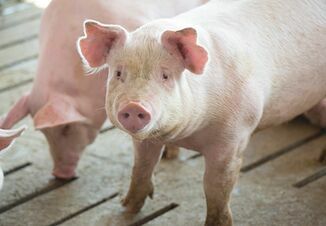 Researchers at the University of Nebraska–Lincoln have identified the gene associated with pigs' susceptibility to this deadly disease that costs U.S. swine producers more than $250 million each year. After eight years of gathering data from more than 1,000 pigs infected with PCV2, lead researcher Daniel Ciobanu, associate professor of animal science at UNL, says this research will aid in the development of genetic tests to help the industry identify pigs more resistant to the virus. Being able to identify pigs susceptible to the virus should improve the general health and welfare of swine populations worldwide, he says. Since this is a natural DNA variant, animals with elevated tolerance to PCV2 can be identified and selected for early on, potentially representing a new and cost-effective method of PCVAD prevention. Previous anecdotal field data showed differences between pig breeds in both incidence and severity of PCV2-associated diseases, supporting the role of host genetics in disease susceptibility. Ciobanu’s research team compiled the largest data set ever generated to understand the role of host genetics in PCV2-related illnesses. They analyzed the pigs both for basic genetic information and indicators of disease, such as the number of viral copies in blood, presence of antibodies and weight loss during infection. Statistical analyses examined relationships between DNA markers located across the genome and indicators of disease susceptibility. 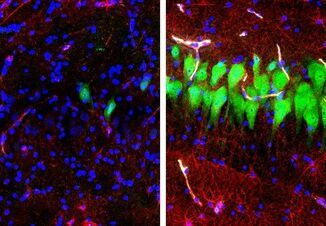 These efforts helped researchers associate PCV2 susceptibility with a specific DNA variant and a gene called Synaptogyrin 2. The discovery also solved a puzzle of swine biology: why certain pigs, but not others, were tolerant to the infectious disease, he says. "We found that a pig's own genetics can impact the ability of the virus to multiply and cause disease," he says. This discovery may also have broader implications across species and viral pathogens, Ciobanu says. The results of the study were recently published in PLOS Genetics. Ciobanu’s team included UNL graduate students Lianna Walker, Taylor Engle and Emily Tosky; Thomas Burkey and Hiep Vu from the Department of Animal Science; Stephen Kachman from the Department of Statistics; Dan Nonneman and Timothy Smith from the U.S. Meat Animal Research Center; Tudor Borza from Dalhousie University; and Graham Plastow from the University of Alberta.